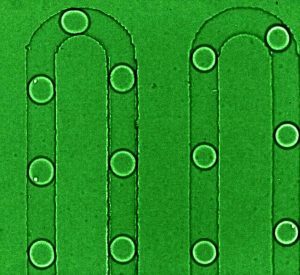 Microfluidics is the emergent branch of fluid dynamics concerned with handling liquid volumes smaller than 1μL. It is mostly motivated by the idea of shrinking the equipment needed for everyday chemistry, biology and biomedical procedures to fit onto a chip of a few squared centimeters. In droplet-based microfluidics, a carrying liquid (usually oil) conveys some nanoliter droplets of an aqueous solution through the chip. These droplets are used as containers in which the liquid of interest is confined by surface tension. We develop new strategies and techniques for the manipulation of droplets in microchannels, and for the encapsulation of micro-objects inside them. 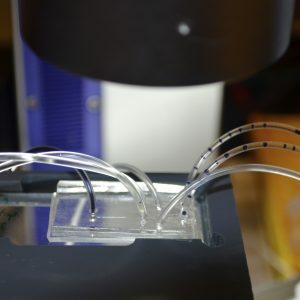 Droplet formation : The first module of most droplet-based microfluidic systems is a junction to bring both oil and water phases and form the droplets. We studied the production of droplets in a microfluidic cross-junction, as a function of the Capillary number Ca, the flow rate ratio Φ between water and oil, and the geometrical parameters of the channel cross section. We reported several regimes of droplet formation (aperiodic and periodic squeezing, dripping and secondary droplets). Based on a time decomposition of the phenomenon, we proposed an empirical relation that predicts the droplet volume as a function of both Ca and Phi, with less than 20% relative error in the whole regime of periodic squeezing. Surfactant can significantly modify both droplet frequency and volume, especially at high Ca and high Φ where the frequency is also the highest. We have finally identified the minimum production frequency, below which tubing compliance starts to interfere and to destabilize the droplet formation. (see related publication). Single cell encapsulation: We are able to encapsulate microparticles within the droplets, including living cells. This has numerous applications, e.g. for single-cell genomics, detection of rare cells, high throughput screening. Nevertheless, the number of cells in each droplet is random and follows a Poisson distribution. Consequently, only a few droplets can contain exactly one cell, as seen in the video below. 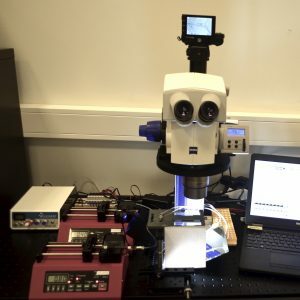 To overcome this problem, we developed a microfluidic module based on real-time vision and embedded valves to sort the droplets containing a specific content (typically one cell). Fluorescence + VIS image of cells in droplets. This work is done in the framework of the scientific network IAP – microMAST.